Compatible with most ACF and NAQT tournament formats. Handle different phases of your event on the same page. Add as many collaborators as you need for simple, distributed tournament management and collaboration. 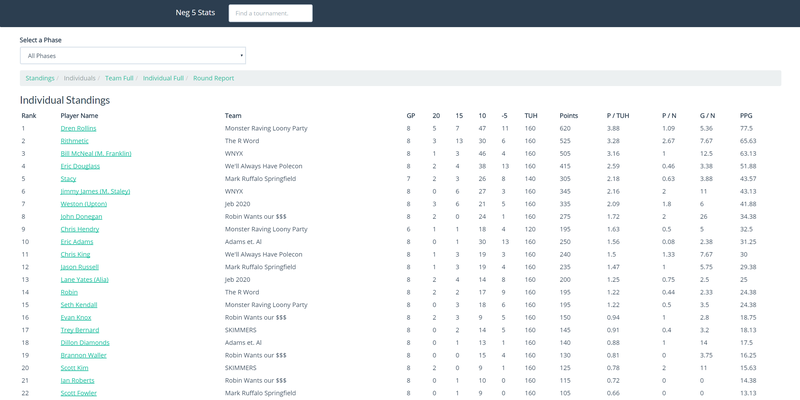 Utilize the built-in scoresheet for fast and accurate scorekeeping. Attendees of your tournament will have access to live, up-to-date statistics as your collaborators enter match information. No more waiting for reports! 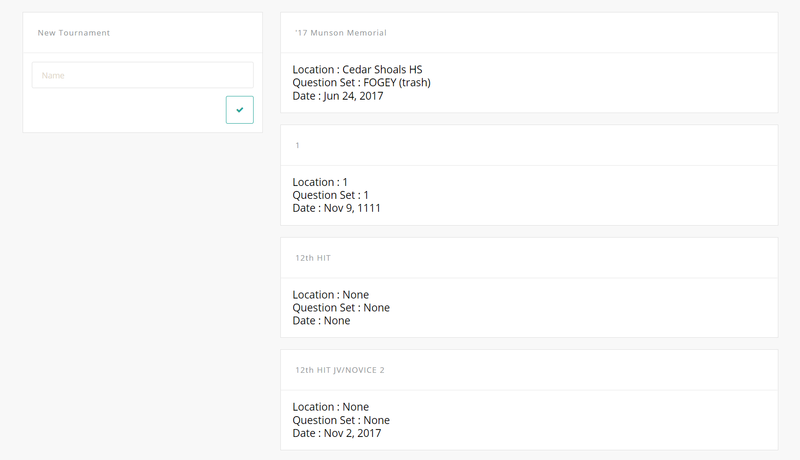 Neg 5 is a web application written by Mostafa Bhuiyan, a former quizbowler at Norcross High School and Georgia Tech, to help other quiz bowl tournament moderators run their events in a distributed, collaborative manner and reduce the downtime between matches and stats availability. 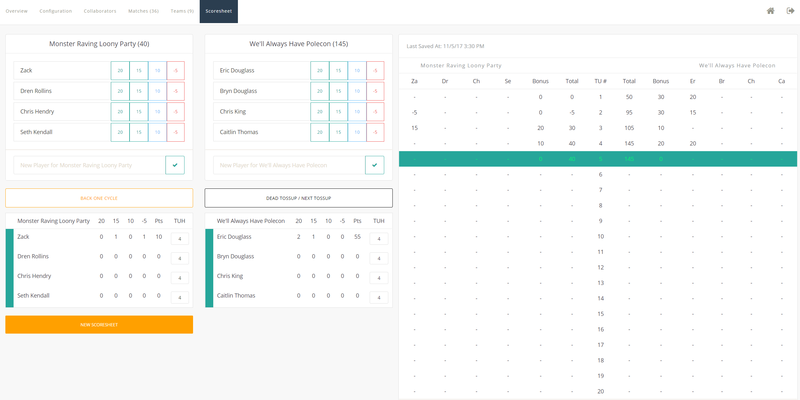 A potentially unlimited number of staffers are able to work together to enter team information and game information all in one application without the hassle and time sink of only one stats keeper. I envision Neg 5 to one day be a one-stop shop for all things quizbowl tournament management. This includes not only tournament match entry and scorekeeping, but also team registration, schedule generation, question packet integration, and anything else that goes into making sure tournament day runs smoothly. Since a large part of Neg 5 is automatic scoresheets, the application also has the potential to analyze tossup/bonus conversion and help packet set writers get better data on their questions and tell if they are hitting their target difficulty. Neg 5 is an Express-based Node.js web application. It uses AngularJS + Bootstrap on the front-end and uses PostgreSQL for its data store. The stats website is a React + Redux based application. Neg 5 is and always will be a 100% open-source project available on Github, where you'll find both the main repository and the repository for the stats site. I am always looking for help, so if this peaks your interests, please see the contributing guide on Github.